Is 4 Million Really Too Much? – Sinking It In! A former Republic of Singapore Airforce (RSAF) pilot is suing a taxi driver for $4 million in lost income after an accident caused by the latter caused the pilot to be permanently unfit to fly. Ms Teng Ling Ying, 32, an Apache pilot, sustained permanent injuries to her wrist which rendered her unfit to continue with her job. The $4 million sum includes compensation for lost income up till retirement at age 50 and future earnings after retirement, in addition to expenses directly related to her injury. Opinions are split on whether Ms Teng has gone overboard in her claims. Some have criticised Ms Teng for being “too much” in claiming such an exorbitant amount from a cabbie who presumably does not earn much. Others felt that Ms Teng is justified in claiming that amount. An Apache pilot is considered a highly skilled professional, no different from a professional sportsman or musician. In other words, not everyone can be an Apache pilot. To be a female Apache pilot is even rarer; in fact it is generally rare for females to be pilots. 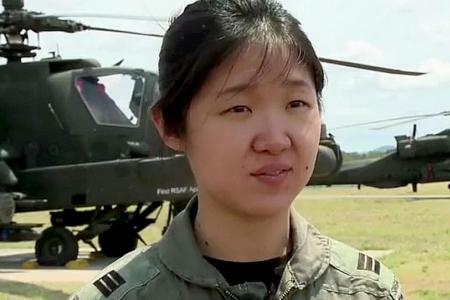 Hence, it is probably a great personal achievement for Ms Teng to have been an Apache pilot. Due to their unique skills set, Apache pilots are paid a premium. Based on a conservative estimate of a monthly salary of $12, 000 and not taking into account pay increments and bonuses, Ms Teng would have earned $2.6 million from now till age 50 ($12, 000 X 12 months X 18 years). Assuming after she retires from flying she is redeployed to another vocation with a 30% pay cut, and that she works till age 62, she could have earned $1.2 million ($8, 400 X 12 months X 12 years). This puts the total lost income figure at $3.8 million. If Ms Teng had been a commercial pilot, she could have earned approximately $250, 000 annually or a total of $4.5 million from now till age 50. Taking all these into account, it does seem like Ms Teng’s claim of $4 million is not that exorbitant after all.